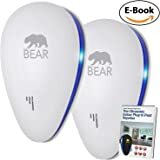 Sold by KitnCaboodleAU and Fulfilled by Amazon. Gift-wrap available. DESIGNED TO FIT: Trolley Bags were designed with the Australian grocery shopper in mind. 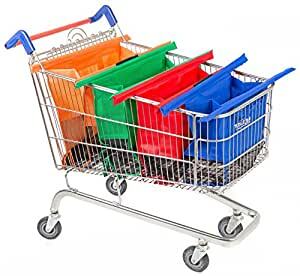 The Vibe Original are the vibrant colour option that fit the standard Australian trolleys found at stores such as Aldi, Coles, Woolworths, IGA etc. EARTH and ECO FRIENDLY: Do your part to help the planet and show all of your neighbours that you care. Eliminate all of the earth damaging and animal hurting plastic bags and tree killing paper bags. 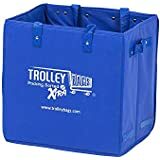 Use Trolley Bags reusable grocery bags to bag your groceries and do your part to make the planet a better place for your kids. DURABLE: Made of the highest quality materials. Double stitched and high grade materials. Avoid all of the cheap knock offs and low end copies. Only the Trolley Bags are the original earth friendly grocery packing solution. Designed to be used for many years. Machine washable. AVOID COUNTERFEITS: Ignore all of the cheap Chinese knock-offs that were made with the cheapest material and design possible. There is a reason that all of the competitors use Trolley Bags in their listing. We are the original and uphold the highest product standards. To prove we are better than the counterfeits we offer a 100% Money Back Guarantee! Sold by KitnCaboodleAU and ships from Amazon Fulfillment. Free yourself from single-use plastic bags and use the Original Trolley Bags when you go shopping. The bags fan out wide with rods that fit any trolley. 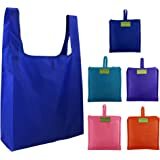 Use four color-coded bags in different sizes to segregate bulky and light, canned and raw, and food and non-food items at the checkout. Your shopping trolley will be organised and so will the boot of your car. 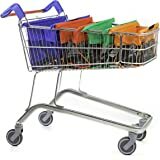 The Trolley Bags Original set of four is a clever solution for everyday shopping. Makes shopping so much easier, going through check out is quicker. 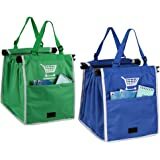 Loading bags in car is quick & instead of having 10 bags filled with shopping this set up with the bags being deep in size you only have 3-4 bags to carry. This order arrived 5 days early. And they are exactly as described. Looking forward to using them on a regular basis. 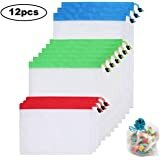 I am wondering how the Mesh insert at the bottom of the bag will hold up over time and with use.